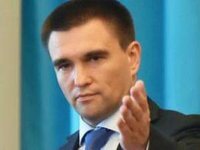 Ukraine's Foreign Minister Pavlo Klimkin has said Ukraine's international partners are constantly raising the issue of the Constitutional Court's decision on decriminalizing illegal enrichment. He said the decision could influence the speed of Ukraine's EU integration and change perceptions of Ukraine as a country trying to change. "Definitely, [it could affect the pace of Ukraine's European integration]. This may affect not only the pace, but the perception of Ukraine as a country that is changing and seeks to go forward. This is one of the key issues that definitely needs to be solved. And to be solved in a way that it becomes a definite guarantee for all, and not a temporary solution," Klimkin said in an interview with the Kyiv-based Interfax-Ukraine news agency. At the same time, the minister added that international partners are extremely concerned about this issue. "This is more than a concern. They believe that this court decision can change the whole paradigm of fighting corruption in Ukraine, and this is a fundamental question for them. Our partners do not say that we cannot make decisions within the framework of the Ukrainian legal field. They say that we have to solve this issue," Klimkin said, adding that Ukrainian partners "very clearly" say the solution of the issue of illegal enrichment should also apply to already existing cases that have suffered as a result of the decision of the Constitutional Court. "If just to cancel all existing affairs now, this will mean, first of all, a loss of trust. And not only for our international partners, but for ourselves," he said.